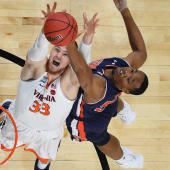 The nature of the NCAA Tournament usually prevents some of the nation's best teams from advancing to the Sweet 16 -- Virginia and Xavier being two obvious examples from last season. But, as I'm sure you know, such simply isn't the case this year. The top 14 teams in the most recent Associated Press Top 25 poll are all still alive. The top 11 teams teams at KenPom are still alive. Each serious national championship contender is still alive. And, really, it wasn't hard to see this coming. Because these are largely the teams that were supposed to be good. Let me take you back to last June. That's when I published an updated CBS Sports Top 25 And 1 to reflect some roster developments -- five months before the start of the season -- and 13 of the schools that will play in the Sweet 16 this week were in the top 21 of those summer/preseason rankings. I had the four No. 1 seeds in this NCAA Tournament ranked No. 3 (Duke), No. 5 (Gonzaga), No. 7 (Virginia) and No. 8 (North Carolina). So please remember this next time somebody tells you preseason rankings are meaningless because, truth is, they're often pretty good, if not great, indicators of what's to come. This NCAA Tournament has served as a reminder. But if preseason rankings aren't your thing, that's cool. Can I show you some in-season rankings instead? Because what's more interesting, I think, than my rankings from last June are my rankings from the first day of February that are based on, you know, the results of actual games. And what they show is something I had, by around that time, thought for a while -- specifically that the top eight or nine teams in the country had mostly separated themselves. Eight of those schools (everybody except Nevada and Marquette) went on to earn either a No. 1 seed or No. 2 seed in this NCAA Tournament -- meaning those eight teams established themselves as the nation's elite in late January/early February and then maintained their places in the sport through Selection Sunday. It should be no surprise they're all still alive. When I filled out my bracket, I automatically advanced every No. 1 seed and No. 2 seed to the Elite Eight based on what I just told you -- that I thought those eight teams had mostly separated themselves. So far, it's been a successful approach. And though I realize it might be more #MarchMundane than #MarchMadness for some, I, for one, have enjoyed watching the teams that proved to be the nation's best all season perform in this NCAA Tournament in a way that correlates with that. Whether things remain chalky going forward is obviously anybody's guess. This event, historically, has a way of getting weird in ways that make no sense. But if the favorites win each game Thursday and Friday, we'll spend the weekend watching nothing but No. 1 seeds play No. 2 seeds in the four regional finals. And wouldn't that be fun? It's never happened, by the way. But there's a first time for everything. And this really might be that first time.